I was a little busy last week so I skipped the Market Update for SteemMonsters; however, since I have a little more time this week I figured I'd go ahead and let everyone know how the market is doing with some booster pack update, cards, and collection update. A few weeks ago I wrote an article about the Expected Value of Beta and Alpha Packs. 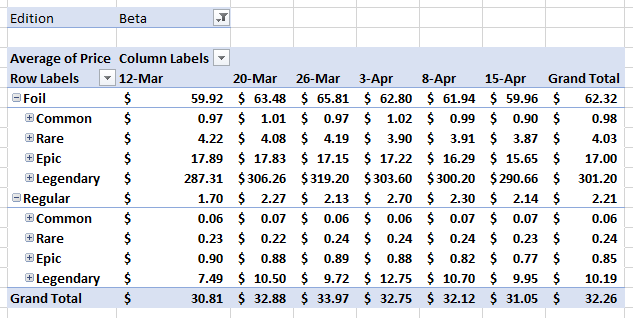 If you look at the table below, the values that were used to create the Expected Value from my first post were those of April 3rd. The ones I'm comparing them to today is pulled from today, April 15th, obviously. The 2 big cards that appear to be driving up the average price for Alpha Booster Packs is the Gold "Foil" Dragon and the Frost "Foil" Giant that went from around $200 to $400 and $500 respectively. Another large price increase is Alpha Flesh Golems and it looks like @mattclarke may have gone on a buying spree again as they have gone from around $0.50 to almost $2. If you remove the Flesh Golem card the average value of a common non-foil Alpha card is cut over half from $0.18 - $0.08. When the above Non-Foil Flesh Golem and the Foil Gold Dragon cards are removed from the average the Estimated Value of the Alpha Booster Pack drops to $1.76. It's not good for Beta Packs Estimated Value this week as prices across the board for both Foil and Non-Foil cards appear to be either barely holding value or on a slight decline. I keep saying this, but until Beta Packs sell out this isn't much of a suprise to me. Honestly, from taking a quick glance at the numbers, the SOME of the Neutral Monsters and the Legendary summoners are what really helps increase the price of the packs. 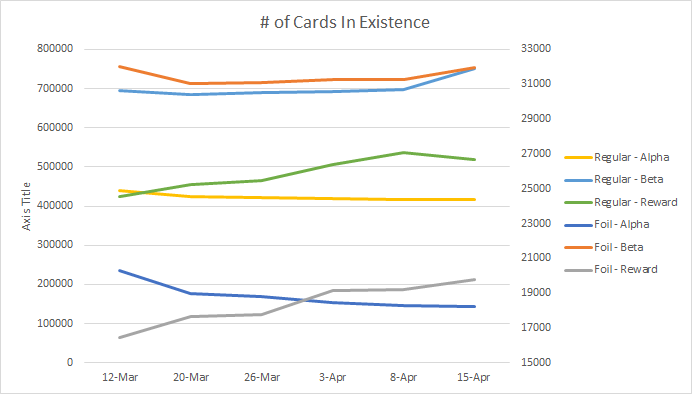 As you can see below # of Cards in Existence has an almost direct correlation to card pricing. If you look at the Alpha Foil Cards there are about 2000 cards less than a month ago and 25,000 less regular cards. On the other hand Beta Foil Cards have remained about constant and regular cards have actually increased by almost 60,000. Foil Reward cards have increaed by over 3000 and regular cards have increased by 90,000. Number of cards for sale trends stays pretty much the same. 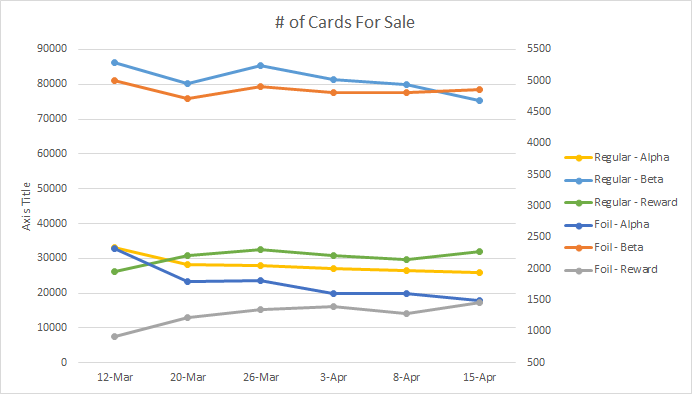 The amount of Reward cards for sale has been steadily increasing, Beta cards are on a slight decline, and Alpha cards have been going down every week. 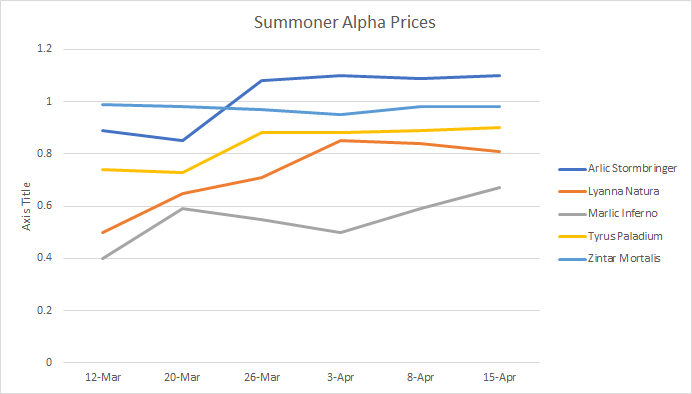 I like to track Alpha Summoner prices. I think these prices will be a good indication of the overall health of the market as they're just going to keep getting more and more rare, and sought after as more players enter and start playing the game. I've been focusing on buying Creeping Ooze and Lord Arianthus as well as buying 1 Beta Pack a week. Currently, my cost average for Lord Arianthus is $1.12 and the current cheapest one on the market is $1.31. Feels pretty good though to get a maxed out Legendary for 12.464 SBD. My cost average for Creeping Ooze is 0.0596 Steem and 0.0362 SBD or basically $0.03. Creeping Ooze's are currently $0.03 on the market, but has been hovering around $0.04 to $0.06. As always would love to hear your thoughts in the comments down below!